Dean gets de-aged! 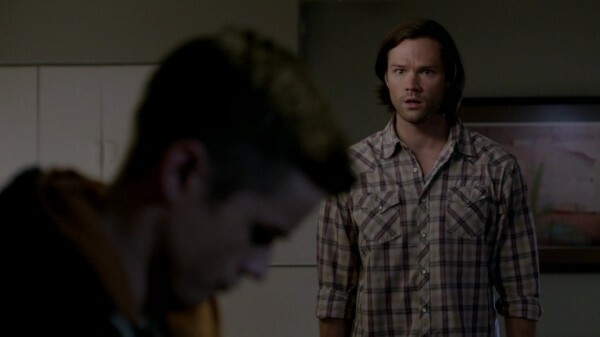 And Sammy gets freaked out along with his brother. I can’t say I blame them, but I certainly did enjoy the adventure they were on in their quest to return Dean to his regular body. Plus, we got to explore the possibilities of what-if, considering what might have become of the Winchesters if time and chance dealt them a different hand. 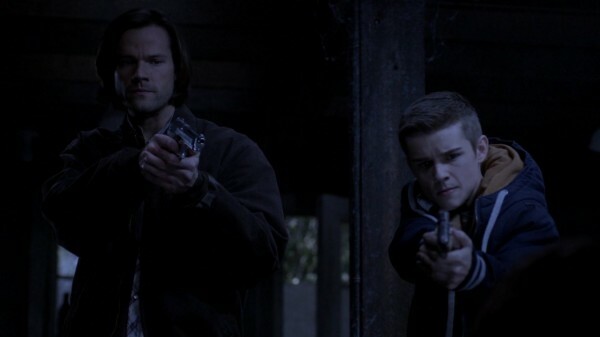 You knew you were in for a fun, albeit dangerous time when Dylan Everett popped up as our favorite Mini!Dean! He was simply amazing in this episode, from start to finish. 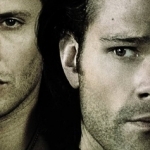 Whenever others play the boys, I always compare the actors to Jensen and Jared. Aside from Chad Everett (old Dean), all of the instances have been flashbacks to the Winchesters growing up. But there’s a difference in playing younger Sam and Dean and playing adult Dean in younger form. Dylan pulled this off spectacularly well. He got Jensen’s mannerisms, his facial expressions, and his vocal patterns all down pat. It was really like watching Dean, but in a much younger body. Kudos to him and the Supernatural casting team for this one. Dean’s been focusing his attention on getting rid of the Mark of Cain, to the point where it’s unhealthy. He’s holed up in the bunker, between the library and his room, just reading countless old books and files and web pages in hopes that the hundredth time will prove to be the golden key to unlocking all the secrets. But, alas, repetition is not going to be the answer here, and Sam knows it. He manages to drag his brother out on a case, to focus his mind elsewhere for a while, and then Dean falls face-first into a witch’s spell. Dean always said he hated witches, and this is proof-positive of the issues they can cause. I figured the Mark would play into the episode somehow later on, especially with how focused Dean was at the beginning, but I didn’t think that sizing Dean down might erase the Mark entirely. That presented a very sticky issue — should Dean return to his adult, angry self or remain a boy without the damnation? And would he have made a different choice had Sam not been put in mortal danger? It’s interesting to ponder, because it’s not like he would be pure again, to grow up without the knowledge of all the dangers and hardships that lay in front of him. But he could also make different choices, reset his years and try again. And Sam would, hopefully, be right there beside him as he reached adulthood. Little brother becoming the big brother? A nice fantasy, even if it was a short-lived reality. Ever since the boys have been in the bunker, it feels like there have been more shout-outs to their youth. It’s like, they finally have a home without wheels, they can ponder all their adventures from growing up on the road in random motel rooms, wandering from state to state in the back seat of the Impala. This episode was no exception, with the little nod to 11 ½-year-old Sammy still believing in the Easter Bunny. And the fact that, after ten years, we find out that the bench seat does indeed move. With guys who are over six feet tall, there’s never been a reason to use the lever, but now you know that it’s usable if needed. So, now where do we go? Dean’s still got the Mark, and he’s still got the accompanying anger. But he’s also got Sammy by his side, and the promise that they will figure this out together. I foresee Cain’s return in all this, because ancient mythology books and long-forgotten spells are all nice, but I don’t think they’re going to find the solution outside the source. 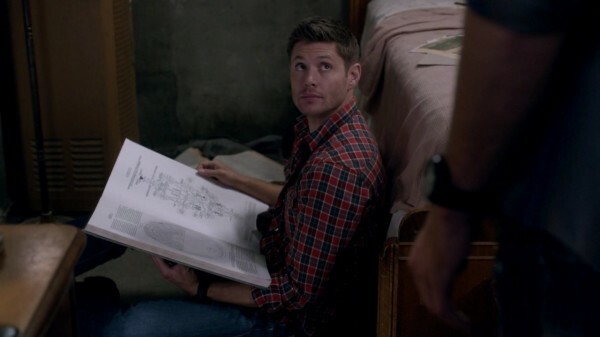 Dean needs to get rid of it before it destroys him. I just wonder how much longer he can last.